The Hilton Honors Ascend Card from American Express currently has an Informr score of 9 out of 10. This score is based on our evaluation of 12 sources including reviews from users and the web's most trusted critics. Hilton Honors Ascend Card from American Express is typically available to those with excellent credit scores (650 or greater). A good value for Hilton hotel fans, the Honors Ascend card makes it easy to quickly earn free night’s stays by offering a substantial introductory bonus and an ample point bonus on gas, restaurant, airfare and hotel purchases. If you’re willing to pay a $95 annual fee, you’ll find the Hilton Honors Ascend Card offers solid rewards not offered by the Hilton Honors Card. It’s a good choice whether you’re a Hilton regular or simply want to save for a few reward nights a year. Hilton Honors Ascend Card from American Express, in my opinion, is one of the top hotel rewards card in the US since it lets you earn tons of points on all purchases made on your card, which you can accumulate to later redeem for hotel stays. - Enjoy complimentary Hilton Honors Gold status with your Hilton Honors Ascend Card. Plus, spend $40,000 on eligible purchases on your Card in a calendar year and you can earn Hilton Honors Diamond status through the end of the next calendar year. - Get 10 free lounge visits every year once enrolled. The Hilton Ascend Card is a great mid-tier card for Hilton visitors. It can also be a great downgrading option for Hilton Aspire card-members. Gold Status and the fifth night free are the highlights of this $95 annual fee card. For Hilton loyalists, the Ascend Card is a nice earner within the bonus categories and can possibly be a keeper card. Its possible to earn enough points to cover the modest annual fee without taking perks into account. Clearly, the Hilton Honors Ascend Card from American Express is a strong consideration for the wallet of any traveler who often, if not always, stays at Hilton properties when on the road. If you are a frequent traveler, whether it be for business or pleasure, you are also well-suited for this card. It won't take long to achieve the thresholds needed for some very attractive perks. 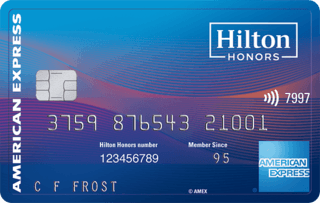 If you are a frequent Hilton Hotels visitor then the Hilton Honors Ascend Card from American Express is nearly a no brainer. The massive 100,000-point signup bonus can be used a lot of different ways. Overall, this is a good card, particularly for domestic travel, and it features the highest point earning potential we've seen among Hilton-branded cards on the market. The Hilton Ascend is a quality co-brand hotel rewards card that’s sure to be a hit with Hilton fans. Featuring new and improved perks the Hilton Ascend is a significant improvement on the older Hilton Surpass.